If you have a hearty appetite and are looking for a great meal at affordable prices, Grumpy’s is the place to go for breakfast or lunch. Located along 6A in East Dennis our family-owned and operated restaurant has been serving home-style cooking since 1991. We serve breakfast & lunch year round to Cape Codders and its visitors, 7 days a week from 6 AM to 2 PM . At Grumpy’s we know that the best tasting meals are made from the finest ingredients. We prepare every meal with only the best ingredients, and each dish is cooked to order with the highest quality meats, cheeses, and produce. Grumpy’s is happy to get your breakfast or lunch order ready to go. Call or Fax in your order, and it will be packed up & ready for you to take when you arrive. T-Shirts, Hats & Mugs are available to purchase. 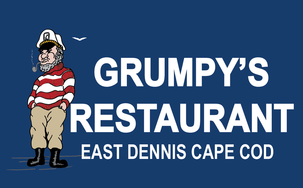 Grumpy’s has been selected as the “Best Breakfast” by the Cape Cod Readers Choice Awards for the past three years!